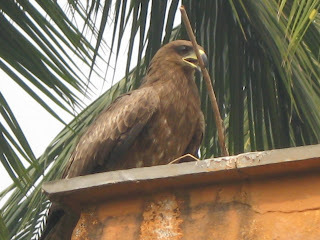 Here's the kite again..... again with a twig in its beak.. Just makes me wonder how long its going to build its nest. I have seen it carrying twigs and straw for a few months now, and every now and then we are witnesses to serious fights between the kites and the crows. We are left wondering if the fights are for food or the nest, or the eggs in the nest..... Wish I could see the kite's nest! And hey, I am getting to be more enterprising. I posted this one directly from Picasa!!! So they are building a nest near you place! fearsome creatures. When i saw the heading in the reader I thought it was the other kite, the one kids fly! I too thought it was the kite children play abut. Nice pic. Haven't seen you for quite a while. was wondering. I have posted about Kanchi. @Mridula : actually, they arent really all that fearful.. in fact, when u see the crows chasing them, you wonder who is the real predator!! and ijust glanced at your kanchi post... and wished i was there! ohh price catch (on camera).. very interesting subject i must say.. Very nice. Find out the nest, it will soon be laying eggs and if you are lucky you may even get to snap the little ones when they hatch! Beware of the mommy though! When i saw the title i thought it was abt kites kids play with!!! This is the first time i've happened to comment on your blog. I agree the title of the article is a bit misleading, but nevertheless, it is a very interesting piece to read. The Kite and the crows must be fighting for the nest coz crows i have heard somewhere that crows are very reluctant to build their own nests and are always on the lookout for some one else's place to lay their eggs.I don't know how far it is true. But given the fact that Mumbai always has a space crunch, is it any wonder that even these poor birds have to fight for their own space?